Logitech's Revue Google TV box is now available for pre-order for $299, revealing a host of new features—HD calling, a wide array of controls, myriad apps, and—if you order today, it'll arrive by the end of the month. Logitech worked closely with Google to make the keyboard a definitive means of navigating Google TV's services, so packed into the Revue's surprisingly thin keyboard is a touchpad, d-pad, and full QWERTY buttons. It's a featherweight, which is a blessing and curse: You won't mind have it on your lap, but it feels kinda cheapo at the same time. The keys are pretty excellent, 'cause Logitech's damn good at building keyboards. The touchpad was responsive, though it's a little weird in this retro WebTV 1996 kind of way that we're not really feeling. A full-QWERTY "mini controller," containing all the same functionality as the full keyboard, will also be available, utilizing the same Harmony remote technology as Logitech's other Revue peripherals. An mobile app—Logitech Harmony Remote—for both Android and iPhone, will give you a third option for controlling the Revue, providing both a traditional menu interface and gesture control—navigating your TV with swipes. Or, ditch your fingers entirely and use voice commands—a Logitech rep was able to call up episodes of The Price is Right by simply speaking the show's title. This entire family of control peripherals will require no additional dongles—a plus for home theater minimalists. If you're a Dish TV owner, you'll enjoy some exclusive perks for the time being—anything on your box will be searchable through the Google TV interface on the Revue, without any additional setup. For those of you without Dish—or any cable service, for that matter—Google TV will function with the tuner of an existing box, meaning your TiVo will hook up fine. Those concerned about Dish's exclusivity needn't worry, with reps saying the deal won't last long, and is only arranged with Logitech, not the entire Google TV ecosystem. Content can also be pushed off of your PC or any DLNA server, allowing for easy local streaming. All major codecs—MP3, AAC, JPEG, and yes, MKV—will be supported. And you can fling content from a phone to the Google TV box. Netflix streaming will be accesible via an Android-based app provided for Google TV—which seems to indicate an Android phone app is likely on its way. 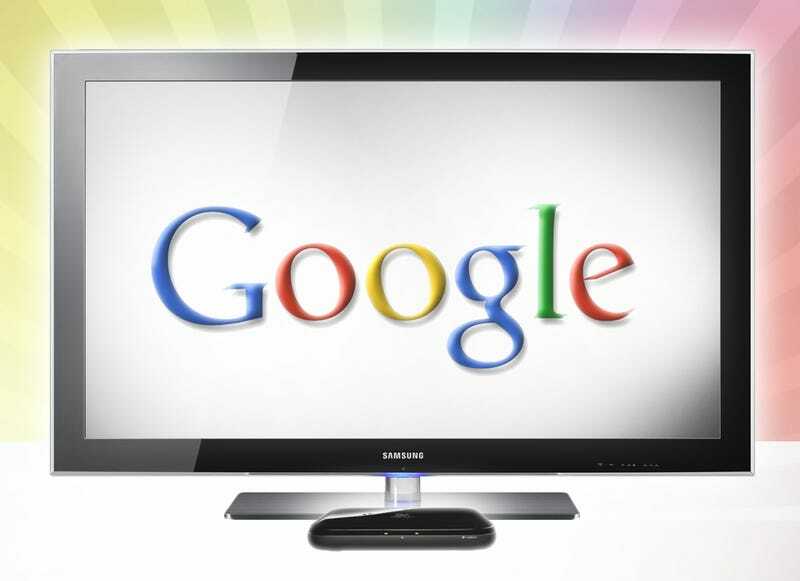 It's up to apps to make themselves open to Google TV's universal search so results can show up. Negotiations between Google and Hulu are ongoing, meaning we could see Hulu Plus show up sometime soon. Other apps will be available from a Google TV market—a silo within the Android Marketplace—which reps say should launch sometime next year, or "as fast as possible." An SDK, based on the existing Android SDK, will be made available, with a Google rep saying devs "will be able to reuse a lot of code." The same rep said a separate search algorithm—"Google TV Search"—draws from a wide body of content, including live television, guide listings, and, when paired with Dish, video stored on your DVR. The TV search will also pull in what's on the web. All the apps demonstrated—including the browser—seemed pretty fast and relatively fluid. The home page was a little slower, chugging as we moved down the navigation bar and it pulled up content from each section. The Chromium browser crashed on Amazon's site while trying to pull up Iron Man 2 on Amazon VOD, but otherwise was quicker than expected. What'll happen with existing Android apps is still apparently up in the air. While a Google rep promised regular Android apps "just work" unless they rely on features like telephony or accelerometer data, they'll figuring out how those apps will work. Will they simply scale up? The specific Google TV SDK is still in development, but since they're hoping to open the Google TV app marketplace early next year, it's gotta be in the next couple months. Since they're still working on the SDK, it's unknown exactly how much access developers will have to the hardware, and how much variation Google TV app devs are going to have to deal with across various implementations. And it seems clear that there will be variations to deal with. Several of the features Logitech showed off, like HD video chat and browsing files on a connected PC to stream, are Logitech-developed features that won't show up in other Google TV devices necessarily. The Revue, combining the built-in Logitech Vid HD app and a separate $150 camera, will provide integrated video chatting, directly from your living room. (Other cameras won't work, because Logitech's Google TV camera has built-in hardware compression for the video.) You'll be able to chat with any other Logitech camera, though, like hooked up to a PC. Incoming video calls will be viewable in two separate areas—an LED on the conferencing camera itself (for notifications even when the TV is off), as well as from the Vid HD app. An initial demo, demonstrating variable zoom levels, looked great—the video was seriously HD caliber, the best we've seen in a home setting like this (a sight better than Kinect, for instance). The call's fidelity can be attributed to the TV camera's Carl Zeiss lens, dual microphones, built-in autofocus, and an emphasis on low-light adaptability. The camera requires at least a 1 Mbps connection.